The Detroit Red Wings fell to the Columbus Blue Jackets on Tuesday following a controversial non-call in the final minutes of 3-on-3 overtime. 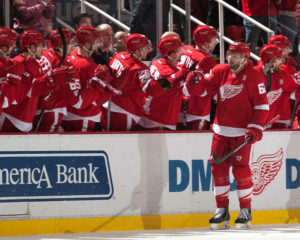 However, the one point helped the Wings keep the pace of Atlantic Division counterparts Tampa Bay Lightning and Buffalo Sabres. Detroit finally started strong, as rookie defenseman Nick Jensen scored early in the first period. Dylan Larkin set up the play with a good pass, before Jensen slapped it past Jackets netminder Sergei Bobrovsky. Detroit led 6-1 in shots at this point (3:22). The team was skating with purpose in the first period. Unfortunately, that early momentum could not prevent Columbus from storming back for two goals later in the period. Brandon Dubinsky scored near the midway mark on a seemingly stoppable shot, as Detroit goalie Petr Mrazek failed to guard the left post fully. Shortly after, Detroit’s Anthony Mantha engaged veteran forward Scott Hartnell in a fight. What ensued was a grapple battle. Mantha successfully managed to fend off any potential punches and even landed a few low body blows before earning the takedown, much to the liking of the home crowd at Joe Louis Arena. Cam Atkinson made it 2-1 for the visitors as he converted a Dubinsky pass into a goal with a quick wrist shot. Detroit finished the first period leading 14-10 in shots. It would require a lengthy two-man advantage for Detroit to tie it. 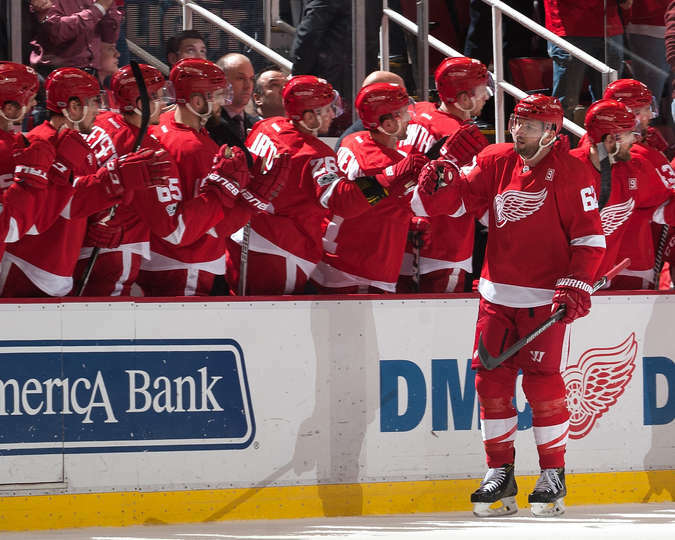 Justin Abdelkader found Thomas Vanek for a tape-to-tape play which Vanek deftly redirected into the net. 14 seconds remained on the 5-on-3 as he scored his first in seven games. After a tightly contested third period, the game reached overtime. Detroit has not had success in 3-on-3 play this season, but the Wings kept up with the Jackets. A shootout seemed likely, until Dubinsky wheeled around and slashed the stick of Detroit captain Henrik Zetterberg. As he quickly skated to the bench for a one-for-one line change, the 3-on-2 immediately led to a Blue Jackets goal, as Dubinsky set up defenseman Seth Jones for a clear slap shot which beat Mrazek high. Consequently, the ice was promptly littered with food and drink items in protest of the controversial non-call. Next, they will travel to Columbus (73 points) on Saturday (5:00) and Minnesota (75 points) on Sunday (3:00) before returning home to play the St. Louis Blues (59 points) on Wednesday (8:00).